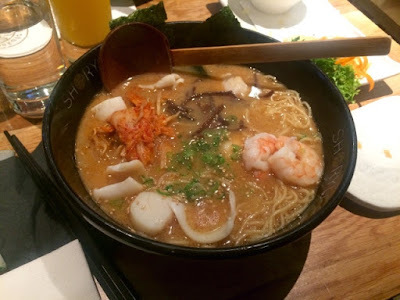 Ramen is not a new thing on the London food scene. I first tested the waters of this, to me, unknown cuisine on a visit to Bone Daddies a few years ago. I was a total ramen virgin back then and new literally nothing about Japanese food besides that they eat sushi. This is not to say that I’m a Japanese food expert now, far from it. I fully embraced the new experience and enjoyed it. I think it’s taken me a couple of years and perhaps a more matured palette to really get into this kind of cuisine and now I’m a huge fan and Shoryu is one of my favourite places to eat it. For those who are still unfamiliar with ramen a very basic explanation would be it’s a sort of Japanese noodle soup. But it’s really so much more than that. The pork broth is traditionally boiled for hours to get the perfect depth of flavour and traditional appearance. The noodles fill the hearty bowl of broth and the variety of toppings really make the dish what it is. There’s usually some seaweed, pork belly is very popular and a soft boiled egg (nitamago) floats on top. The possibilities however are pretty endless. Shoryu‘s staff are really knowledgable and great at guiding you through the menu when all the unfamiliar names get a bit confusing. There’s even a dictionary at the back of the menu to help you work out what everything is. We began with a couple of cocktails. There’s quite an extensive drinks menu with a wide range of cocktails and sake and we were lucky enough to arrive within Happy Sake Hour when all cocktails were £6. 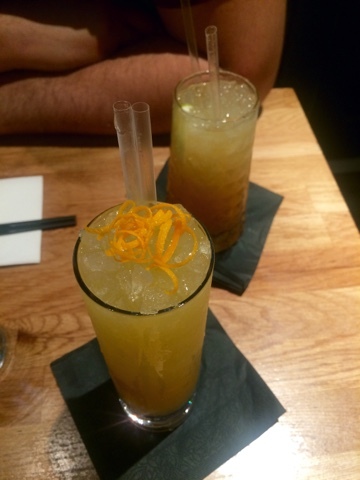 I ordered the Okinawa, from the Summer Specials, which was nice and I’d have probably enjoyed drinking on its own however I did find the orange juice and amaretto combination a little too sickly sweet to have with dinner. The Boyfriend had the Tiki Japan which was quite a strong rum and pineapple based cocktail but went much better with dinner. Whilst the ramen is more than enough to fill you up on it’s own we decided to order a couple of the side dishes as well just so we could try a few new things. Eating there on Bun Monday, when Shoryu buns are on 2 for 1, we had one char siu pork belly bun and a tiger prawn tempura one between us. 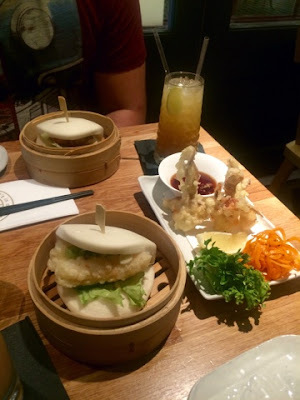 I have tried these pillowy type buns before and not been too fussed but Shoryu definitely swayed my opinion, they were a lot lighter and less stodgy than ones I have eaten before and the king prawn tempura in my one was delicious. Deep fried soft shell crab was our other side dish to try which came chopped into sections, so less intimidating for the unfamiliar diner than whole versions I’ve seen before. The rich dipping sauce paired with it well. Now we’ve covered the extras I can really get down to the star of the show: the ramen. I opted for the Kimchi Seafood Tonkotsu (pictured above) which was a lovely enormous bowl of noodles and a slightly spicy broth with juicy prawns and scallops, squid, kikurage mushrooms, seaweed and spring onions, bean sprouts, sesame and shallots. There was also the traditional nitamago egg, but this was swiftly transferred to the The Boyfriend’s bowl as I really can’t stand boiled eggs. I’d have requested to not have it if The Boyfriend hadn’t been so keen on getting an extra one. All the seafood in this lovely dish was perfectly cooked and they were pretty generous with the amount, although I guess that’s the reason it’s one of the most expensive options. From my limited experience of ramen I would strongly recommend the ones that come with a bit of a spicy broth, that’s my preference anyway. It was by no means super spicy but I just really enjoy that little kick of heat. This big bowl of ramen was like a big warm comforting hug and that’s why I think ramen has begun to feature much more highly on my list of favourite foods. At first it seems so unfamiliar and a little scary with all these names of different flavours and ingredients you’ve never heard of but once you’ve thrown yourself in at the deep end and embraced it, it feels like a home comfort. 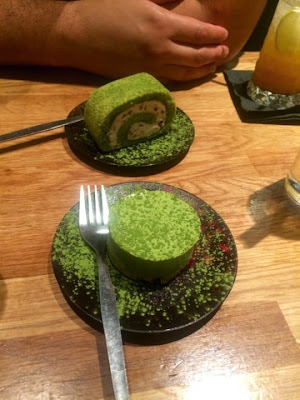 In the spirit of trying unfamiliar things we ordered a couple of matcha flavoured desserts to share. Matcha, a type of powdered green tea is a common feature in Japanese desserts. Both the matcha cheesecake and the matcha azuki rolled cake were quite small, which was actually quite ideal after a big bowl of ramen. Both were light and tasty, I wouldn’t say they blew me away as the matcha is quite a mild flavour but a nice little sweet treat to round of the meal. We obviously went all out trying a little bit of everything on our visit but it’s such a laid back environment I’d happily pop in there on my own to polish off a bowl of ramen on my lunch break. I’d also like to go in there and trying skipping the ramen (as much as I love it) and just having a selection of their side dishes, tapas style, as there’s lots of interesting and tasty sounding things on there, including a whole sashimi section. It’s an anything goes sort of a menu really. Even if you’ve never heard of anything they serve up before I’d highly recommend a trip to Shoryu to try some of it. It’s such an easy place to try something new, the menu itself explains everything pretty clearly and the staff are so helpful.